Life is often hard, and even the clearest skies have clouds sometimes. And as crocheters, we can make it better. One way is by making prayer or comfort shawls for those who need an extra hug, and to feel our love. 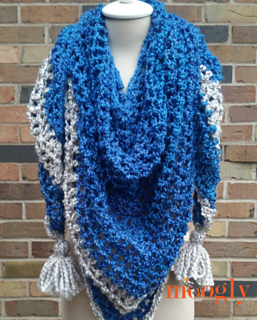 The Big Sky Shawl was designed with this idea in mind - while maintaining a sense of style. The Big Sky Shawl is made with Lion Brand Homespun, a favorite yarn for those crafting for others. It’s warm, soft, and the yarn creates the texture - which means simple stitches shine. 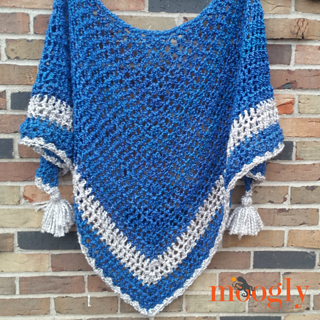 And the Big Sky Shawl does indeed use simple stitches, so almost anyone can make this easy crochet prayer shawl pattern! The colors I used for the Big Sky Shawl are Montana Sky and Clouds - appropriate, no? Streaks of gray cut through the blue sky, but there is more blue than gray, to remind us of the bright times to come. The shaping creates a triangular shawl that’s more V shaped than anything, with corners that wrap easily around the shoulders to stay in place. And it doesn’t just help the person you give it to - it helps you too! Studies have shown time and again how crocheting improves our mental health, making this an excellent way to help others while you help yourself. 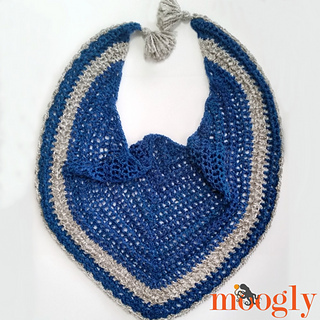 You can wear the Big Sky shawl across the shoulders as a standard shawl, or wrapped around the neck with the point in front - either way, the optional tassels on the points help keep it where you put it. It’s only 20 rows long (plus a couple rounds for the border), so you can whip one up in a just a few evenings.